Airtel NG Android 1+1 offer is not a new introduced plan, it was launched in October 2014, but the plan has officially stopped working for a while By Airtel. It seems that Airtel have noticed that they are missing lots of their customers, since people are porting to other networks because of cheap data bundle. 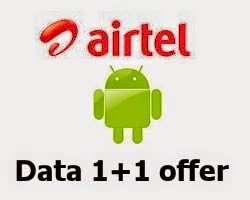 Now Airtel has re-introduced their Android 1+1 offer. You can now subscribe to Airtel 4GB with N2,000 and 9GB with N3,500, both last for 2months. The subscription method is not changed, you can still subscribe with the old codes. Before you load the required amount to your Airtel SIM. When you receive a message: “Dear customer, you do not have sufficient balance for this plan”, which means your line is eligible for the offer. Proceed with the loading of required amount to your account. But if after dialing the code, you get this message “Dear customer, you do not qualify for this plan”, don't load the money on it because it will not work for that SIM, but you can always try other Airtel SIMs at your disposal, definitely one would turn up for you or go for the Airtel First Android Bundle(AIS) which support all Sims. Load your Airtel line with N2,000 Airtime. You'll be credited with 4GB data bundle valid for 60 days. To check your Android data balance, simply dial *223#. Load your Airtel line with N3,500 Airtime. You'll be credited with 9GB data bundle valid for 60 days. Have Questions to ask or have anything to contribute? Kindly use the comment form below. More so, Remember to use the "Share", "Like" and other Share buttons to share this post with your friends. Will this plan work using a modem? sure, all you need to do is to configure your modern with it. thanks for dropping your comment. Okay, how do i configure my modem to work wit it? The modem package has been stopped, but there is still a way to use it with your Pc simply by tetering it via Hotspot. hope to see you soon.